For the last four years, Mondo Records has been growing as one of the world's leading trance and house orientated record labels. As a label, we always strive to deliver not just the biggest tunes, but the freshest and most original sounding records around. We felt the time was right to express that sound, through a series of compilations that not only captured the essence of Mondo and its many artists, but all the records that we are passionate about. Very few compilations truly capture the music that is close to the hearts of so many clubbers around the world - but this one really does. For the second instalment in this series, Darren Tate and Dale Corderoy take you on a journey through club cultures - from the initial Sunsetters mix (as the sun goes down, these are the tunes that take you somewhere - laid back, but full of emotion), through to the Daybreakers mix (the early morning anthems that cry out 'epic' as arms are lifted into the air). The result is a seamlessly mixed tour de force - an artist and musical triumph of dance classics; past, present and future rolled into one. 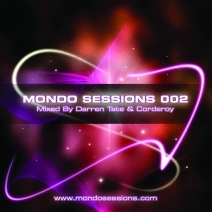 The mix captures the essence of the ever popular Mondo Sessions Radio Show hosted by Darren Tate and Dale Corderoy. The show has now grown to almost cult status due to its diversity and impeccable level of music. Every week, even more stations are licensing the show for broadcast as it continues to spread significantly around the world.